The Mainheim Colossus in Spain. 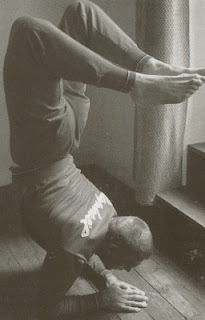 Rudi Altig relaxing with his love for yoga. German rider, Rudi Altig was one tough cookie. In Germany he dominated track racing, in the 1950's, when track riding was so popular. He was known for his very strong athletic build which he often practice yoga before and after races. From 1959 to 1961 he was world pursuit champion winning 22 six day races. Highly successful, he turned road professional in 1960. 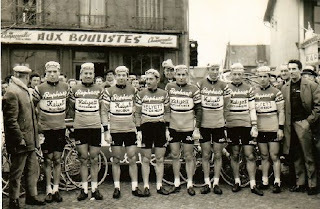 In 1962 he joined the St. Raphael team as a super domestique to leader Jacques Anquetil. The team entered that year's Vuelta a Espana with Anquetil eyeing the overall. The Mainheim Colossus was incredible beating favorite Master Jacques in the San Sebastian time trial. Anquetil was shocked and upset that he was beaten. Altig was so dominate he won a total of three stages; the overall and points classification. 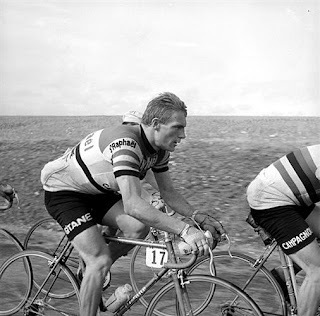 Anquetil had to drop out of the race, defeated. "Jacques was so angry that he asked me to make sure Altig raced on an ordinary bike and not on an ultra-light machine he could get some benefit from," director sportif Raphael Geminiani revealed years later. Since that major win, Altig did very well in the Tour de France & Giro d'Italia benefiting from his natural strength to win many stage victories! Naturally gifted & tough as nails, Rudi Altig excelled at one day races. During his career, he won the Tour of Flanders & Milan San Remo! Inset image: The St. Raphael team. Altig is first from left and Master Jacques is fourth from right.